There's one story dominating many of Northern Ireland's local papers this week - the tragic deaths of three teenagers in a crush outside a hotel in Cookstown. 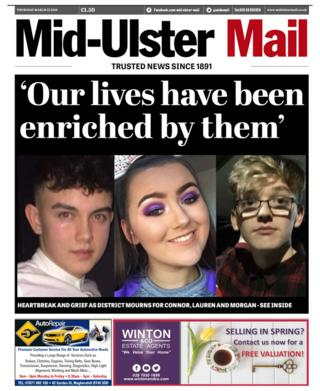 The front page of the Mid-Ulster Mail, which is based in the County Tyrone town, features images of the three victims and a headline paying tribute: "Our lives have been enriched by them." Its coverage includes an eyewitness account, the police appeal for more information and sympathy expressed for the families of Morgan Barnard, Lauren Bullock and Connor Currie. Many people in the area have been signing a book of condolence for the victims, the paper reports. In County Fermanagh, there is also a focus on the events in the neighbouring county. The Fermanagh Herald's front page points out that young people from Fermanagh often travel to Cookstown for a night out. Elsewhere, the paper also reports on the sudden death of a "gifted" young sportsman, 17-year-old Kyle Innes Whiteside from Fivemiletown. His community is shocked at his passing, states the paper. In the north west, the Londonderry Sentinel carries an opinion piece from Democratic Unionist Party (DUP) MP Gregory Campbell, in which he says there was an "extreme reluctance" to investigate the actions of former deputy first minister Martin McGuinness during Bloody Sunday. "The word 'Bloody Sunday' in Northern Ireland came about as a result of a relentless media campaign," writes Mr Campbell. He asks why Mr McGuinness's actions on the day were not investigated by police or the Police Ombudsman and contrasted that with the decision to investigate former soldiers for their role. Thirteen people were killed on Bloody Sunday. The Public Prosecution Service (PPS) confirmed this month that it would prosecute one former paratrooper over two killings. Mr Campbell asserts that Mr McGuinness "appeared to be exempt" from being questioned after the publication of the Saville Report on the killings. It found that Mr McGuinness was present at the time of Bloody Sunday and "probably armed with a sub-machine gun" but did not engage in "any activity that provided any of the soldiers with any justification for opening fire". The former deputy first minister died in 2017. 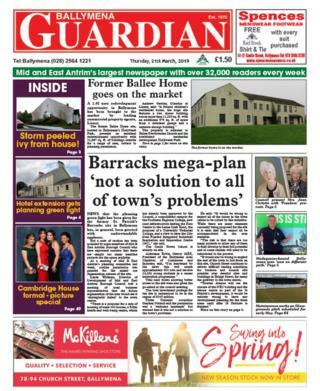 In County Antrim, the Ballymena Guardian leads with plans to regenerate the former site of St Patrick's Barracks in the town. The project has moved a step forward after planning permission was granted for the site, says the paper. Those plans include up to 140 homes, a leisure centre and new road infrastructure. However, the Ballymena Guardian also reports some caution around the proposal. Stephen Nicholl, an Ulster Unionist councillor, said that while planning permission was welcome it was not a solution to all of Ballymena's problems and added there must be "realism" around the plans. 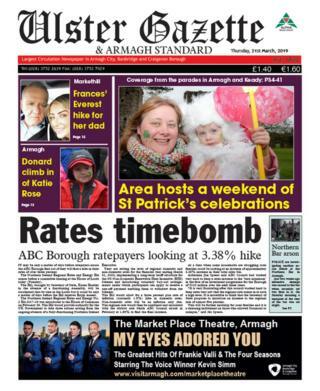 The Ulster Gazette in County Armagh is not holding back on its front page splash, with the headline: "Rates timebomb." Ratepayers to Armagh, Banbridge and Craigavon Borough Council are looking at a 3.38% rates increase, the paper reports. Elsewhere, the Ulster Gazette focuses on Sidney McIldoon, who received a lifetime honour at the annual Orange Community Awards. The former prison officer served as grand lecturer for the Orange Order for the last 16 years and received the award in recognition of his role in initiating new members. "Sidney personifies the many qualities of an Orangeman - being loyal, committed, courteous and honest," said Orange Order Grand Master Edward Stevenson. The Newry Democrat's lead story also features a local who has made a big contribution to their community. 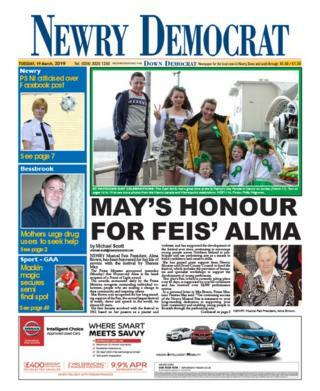 Alma Brown, the president of the Newry Musical Feis, has been honoured by Theresa May. The 93 year old has been given a Points of Light award, which is granted by the prime minister to deserving recipients on a daily basis. In a letter, the prime minister told Ms Brown that the "continuing success of the Newry Musical Feis is testament to your long-standing dedication to supporting your local community and enabling young people to flourish through the performing arts". Inside, the paper's second page carries a warning from the mothers of two men who died from suspected overdoses. Both women spoke of their devastation and issued a plea over the dangers of drugs. The Newry Democrat also reports this week on a protest held by members of the Free Presbyterian Church outside a musical in the city. An amateur production of Jesus Christ Superstar was picketed by protestors who consider it "blasphemous". However, one paper revelling in the success of some local young people is the Fermanagh Herald. It dedicates seven pages to the triumph by St Michael's Enniskillen in the MacRory Cup last Monday. The sports news even makes it into the paper's editorial, which hails the team for playing the game as it is meant to be played - quite the complement.